The essays in Against Everything are learned, original, highly entertaining, and, from start to finish, dead serious, reinventing and reinvigorating what intellectuals can be and say and do. Key topics are the tyranny of exercise, the folly of food snobbery, the sexualization of childhood (and everything else), the philosophical meaning of pop music, the rise and fall of the hipster, the uses of reality TV, the impact of protest movements, and the crisis of policing. Four of the selections address, directly and unironically, the meaning of life—how to find a philosophical stance to adopt toward one’s self and the world. Mark Greif manages to revivify the thought and spirit of the greatest of American dissenters, Henry David Thoreau, for our time and historical situation. Mark Greif is co-founder of the literary and intellectual journal n+1. He is also currently an associate professor at The New School in New York. “Susan Sontag was against interpretation. Laura Kipnis was against love. Seven were against Thebes. Mark Greif is against everything...Against Everything is really a book on a single subject: contemporary life, more specifically, the kind of life that someone who would buy such a book, or read a column about such a book—in short, yourself—might right now be living. It’s meant to be consumed from beginning to end. It makes you think...Greif’s argument—and this is what separates him from the usual solver of the times—is that what’s killing us is deeply embedded in our social and economic system. It’s not the gym that’s the problem. It’s the way we live now, which is making the gym seem like a solution to something. Greif thinks that a whole lot will have to change before real choice is possible. Until then, it’s not enough to be against the box-office and the real-estate section and the best-seller list. Until then, we have to be against . . . everything." 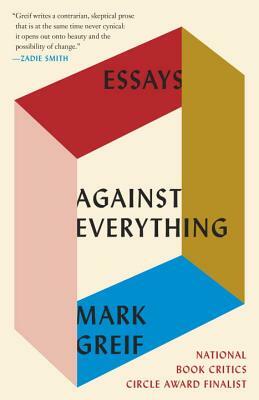 "Mark Greif's Against Everything—as its title suggests—matches brilliant critique with improbable optimism. His essays risk embarrassment to analyse the irritations of urban life—hipsters, foodies, gym-goers—so that we might see these characters in ourselves, and treat them with, if not more kindness, more interest." "Against everything, if it was corrupt, dubious, enervating, untrue to us, false to happiness,” writes n+1 co-founder Mark Greif...Greif isn’t a doomsayer, but a smart man, soused in decency and fellow feeling. He would like to know the meaning of life...Civil disobedience is a lived way to counter plutocracy. Consider Occupy Wall Street, an action in which Greif participated. “Fight the Power.” That’s to live." "Greif, as we come to know him in these essays, is a deeply hopeful thinker, full of visions of a better, even perfect, world. His disciplined, thoughtful critiques of all manner of cultural phenomena—from YouTube videos to the mania for exercise—rest on an intuition that the world we have been given is not good enough...To argue this point with Against Everything is not to dismiss Greif’s achievement, but the reverse. An intellectual’s job is to provoke thought and argument, and this Greif does as well as anyone writing today." "Greif is a critic of the modern American condition...a dazzling intellectual, and like all the best philosophers, he thinks we all can and should live our lives like philosophers. To read Against Everything is a good start on that path."